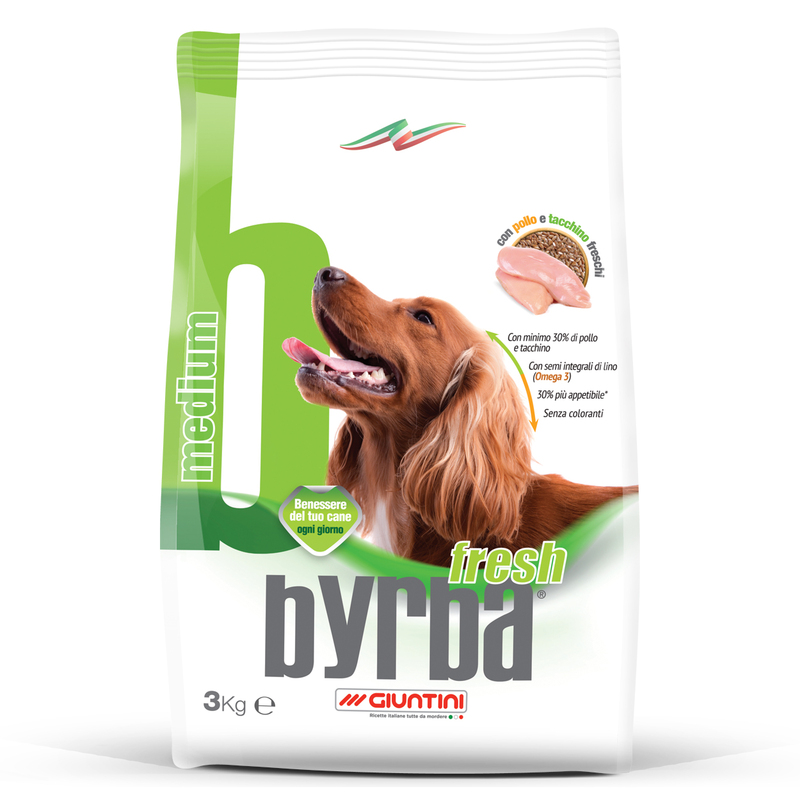 From Byrba experience was born Byrba Fresh Medium: the evolution of an historic Giuntini’s product for medium breed dogs. Only carefully choosed raw materials as chicken and turkey fresh meat take place in a new recipe Byrba Fresh Medium to give to your best friend a complete and balanced meal, enriched by whole flax seeds, natural source of Omega 3. Thanks to his balanced count of fibre, Byrba Fresh Mini helps an easy digestion for a daily wellness of you dog. It is without colouring agents but 30% more palatable. Byrba Fresh Medium at will! Cereals, Meat and animal derivatives (chicken and turkey min. 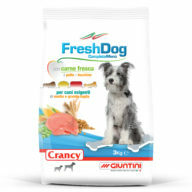 30% of wich 4% fresh meat), Derivatives of vegetable origin, Oils and fats, Seeds (linseeds min. 1%), Vegetable protein extracts, Minerals. Crude protein: 28,0%; Crude oils and fats: 12,0%; Crude fibres: 2,5%; Crude ash: 7,3%; Fatty acids: Omega 3: min. 0,6%. Vitamin A: 16000 I.U./kg; Vitamin D3: 1000 U.I./ Kg; Vitamin E: 300 I.U./kg; E1 Iron 35 mg/Kg; E2 Iodine: 0,5 mg/Kg; E4 Copper: 7,5 mg/Kg; E5 Manganese: 35 mg/Kg; E6 Zinc: 27,5 mg/Kg; E8 Selenio: 0,05 mg/Kg.